That’s the proposition for the consumer… do I spend nearly $1000 dollars on a fixed, compact 2x when I can have any number of variable scopes, or for just a few hundred more have a proper 4x ACOG? It’s very much like a red dot. That’s my first impression as it acts like a red dot with 2x magnification. The field of view through the optic feels narrow, but being that the 2x magnification is so insignificant, you can shoot both eyes open negating the impact of the narrow field of view. The BAC works wonderfully here, as it’s quick and easy to find that red triangle in the objective window and the low magnification doesn’t fight your brain like the 4X ACOG’s do. The 2x magnification does help your eyes make the most out of close to mid range targets, and the optics are clear and brighten darker images as well. This is a great substitute for shooters with aging eyes or those who want help seeing targets out in the AR sweet spot of 100-300 yards. No serious concerns over build quality, as Trijicon has usually brought their A game to ACOG series optics. This is my new red dot substitute. It’s temporarily sitting on the A2 until my Larue mount arrives for my modern rifle. The TA47R feels fast up close and should give my vision a bit of padding for distant shots. It also enhances low light images where as a red dot does not. The eyebox is forgiving, and the eye relief is substantial. You can get your eye right on top of the optic, or have it far back and still get your bright triangle. It’s lightweight, and very low profile. A great choice for people who want a lightweight build. The features are worth it IMHO. Instead of a red dot, if you can snag one of these on clearance for a rifle build (I nabbed it for $599) then you have a tough optic with many benefits over a red dot. 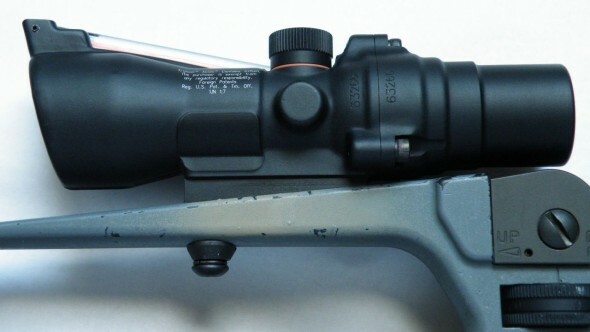 Some deficits over a red dot include the tritium lamp dimming, substantial cost, and no way to control brightness in all lighting conditions, as well as a smaller window for reticle movement before the reticle is lost in the edges of the optic. I also run another carbine with the TA-33 3×30 (red horseshoe reticle) for longer work, but that little TA-45 was a revelation. Once briefly examined a TA-47 2X, and preferred the 1.5X unit.